Meghalaya was inaugurated as an autonomous state on April 2,1970. It was declared as a state of the Indian Union on January 21, 1972. Meghalaya is situated in the north-eastern region of India, between the Brahmaputra valley in the north and the Bangladesh in the south. The state of Meghalaya (the abode of clouds) is geographically known as the "Meghalaya Plateau" or the "Shillong Plateau". The area is made of the oldest rock-formations. Meghalaya consists of the Garo, Khasi and Jaintia hills along with their outliers formed by the Assam ranges. It is the detached north-eastern extension of the Peninsular India. Part of it lies buried under the alluvium deposited by the Ganga-Brahmaputra system of rivers. This gap is known as Malda gap (between Raj Mahal hills/Chhota Nagpur and the Shillong Plateau). Meghalaya Plateau's elevation varies between 150 meters to 1961 meters above sea level. The Plateau is highly dissected and has irregular terrain in the western and northern side. The southern side is marked by a continuous escarpment with steep slopes. The broken hills and ranges in the north are not of a well defined boundary. 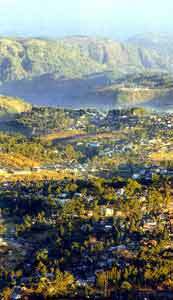 The western part of the plateau or the Garo hills has an elevation of 600m above sea level. The most important relief feature of this part of the plateau is the Tura range with its highest point at Nokrek 1515 meters above sea level. The central and the eastern part of the plateau or the Khasi and the Jaintia hills district play prominent senile topography. This part of the plateau is characterised by the presence of many peneplained surfaces, flat-topped hills and numerous river valleys. The central upland zone is the most important relief feature of the area and covers more than one-third of the area, east of the Garo hills. The highest point of this part of this plateau and that of the entire state is the Shillong peak whose elevation is about 1965m above sea level. In the Garo hills, the important rivers of the northern system from west to east are the Kalu, Ringgi, Chagua, Ajagar, Didram, Krishnai and Dudnai. Of these only the Krishnai and Kalu are navigable. The important rivers of the southern system are Daring, Sanda, Bandra, Bhogai, Dareng and Simsang. Simsang is the largest river in the Garo hills and navigable only for about 30 Km . 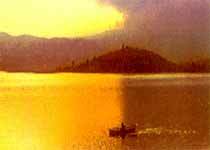 Other navigable rivers are Nitai and the Bhupai. In the central and eastern section of the plateau the important northward flowing rivers are Umkhri, Digaru and Umiam and the south-flowing rivers are Kynchiang (Jadukata), Mawpa, Umiew or Barapani, Myngot and Myntdu.